April 14th is National Pecan Day. Since we got our taxes in the day before, we treated ourself by making this layered Butter Pecan Chocolate Fudge yesterday. Pecans are the only major tree nut indigenous to America, native to the southeastern United States. They are not found naturally (i.e. wild, uncultivated) anywhere else in the world. Even though they can be cultivated elsewhere, American growers produce more than 80% of the world’s pecans (source). The pecan appeared more than 100 million years ago. Flash-forward 100 million years: Wild pecans were a staple in the diets of Native Americans, who called them pecanes—an Algonquian word that refers to any nut requiring a stone to crack, such as pecans, hickory nuts and walnuts. The nutritious nut kernels were a major food source for Native Americans in the fall and winter, months when there were no crops to harvest. They also created a nut milk called powcohicora, by fermenting powdered pecans into a drink. 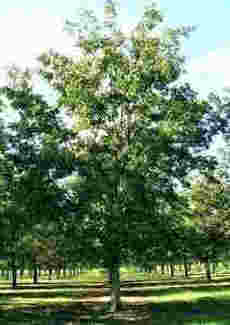 After centuries foraging wild pecans, Native Americans began planting pecan trees (photo #2) and trading the nuts (photo #3) to European explorers. It takes nearly 10 years for a pecan tree to yield a full output of nuts. But it then produces nuts for 100 years or more. Pecans are one of our favorite nuts. With their rich, buttery texture, sweet taste (no “bite” as with walnuts) and protein and other nutrition*, we give them two thumbs up. Thanks to Pampered Chef for this yummy layered recipe of chocolate fudge and butterscotch fudge with pecans (photo #1). Cut into bite-size pieces, you can have a piece without guilt. The fudge keeps well in an airtight tin. 1. LINE the bottom of a 8-1/2 X 10-inch pan with a piece of parchment paper. 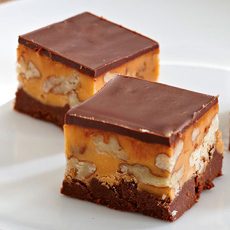 This delicious chocolate fudge has a top layer of butterscotch fudge with pecans (photo courtesy The Pampered Chef). A groove of pecan trees (photo courtesy Perfect Plants Nursery). Beautiful pecans. Their shell is one of the prettiest among nuts (photo courtesy Home Depot). 2. COMBINE the butterscotch morsels and half of the frosting in small saucepan. Stir over low heat until melted and smooth. Add the pecans, stirring to coat evenly. Spread the butterscotch mixture evenly over the parchment paper. 3. RESERVE 1/2 cup (125 mL) of the chopped chocolate for a garnish. In the same saucepan, combine the remaining chocolate and the remaining frosting. Stir over low heat until melted and smooth. 4. CAREFULLY POUR the chocolate mixture over the butterscotch layer in the pan, spreading evenly. Refrigerate 10-15 minutes or until set. 5. INVERT the bar pan onto a cutting board. Carefully peel the parchment paper from the fudge. 6. PLACE the reserved chocolate and oil in a microwaveable bowl. Microwave, uncovered, on MEDIUM for 1-1/2 to 2 minutes, stirring every 30 seconds. 7. SPREAD the chocolate evenly over the top of fudge. Refrigerate 15-30 minutes or until firm. Cut into 60 small squares. HOW ABOUT SOME CHOCOLATE PECAN BROWNIES? 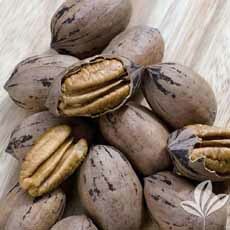 *A one-ounce serving of pecans (approximately 20 halves) contains 196 calories, 20.4 grams total fat (1.8 saturated fat), 0 mg cholesterol, 0 grams sodium, 2.7 grams dietary fiber and over 19 vitamins and minerals including vitamin A, vitamin E, calcium, potassium and zinc. They are one of the heart-healthy nuts recommended by the USDA: You can have an ounce a day to keep the doctor away.